We’re ready to pay CASH for your Surplus, Excess, Obsolete Packaging Inventory TODAY! Let McKernan Packaging Clearing House help you liquidate your excess packaging, while also allowing you to recoup some of your investment. If your organization is like most, at some point, you’ll find yourself with surplus or overstock packaging. You focus is on your business and, often, there is not the time or resources to sell your excess components piece by piece. You have a few choices…recycle it (if possible), throw it away, or, the most profitable alternative, contact McKernan. It’s a hassle-free and secure way to sell your excess inventory. We are able to make a deal within one business day, after evaluating your surplus. Plus, we pay shipping and coordinate the transportation. This is a Nationwide program. Let us make you an offer today! 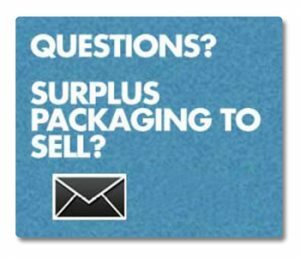 Call: 1-800-787-7587 or 775-356-6111 and ask for a Surplus Specialist. At McKernan, we can help you make those smarter decisions when it comes to your surplus packaging. If you’re like most companies, no matter how well you plan your purchasing and production cycles, you may end up with unneeded inventory. Simply throwing it away or dumping it in a landfill can cost you in more ways than one. If you’re like most businesses, the decision to simply dump your inventory and not at least recoup some of your costs is a difficult decision to make. When you call McKernan, we will evaluate your surplus and make the best offer that we can. So what do you do? Call McKernan, we’ve got the solution. We Buy Surplus! McKernan has been able to help companies, like yours, free up valuable warehouse space, while also recapturing some of the initial capital. You don’t have to get buried in excess or obsolete packaging any more. It doesn’t happen intentionally and it doesn’t happen often, but when it does, a quick and easy call to McKernan can be the solution you didn’t know you had. We’ll evaluate your surplus and have an offer back to you usually the next business day. McKernan Packaging Clearing House has been in business for 60 years. This gives us the expertise to be able to guide you through our simple process of converting your surplus, obsolete, and excess packaging into cash. We have a large, friendly staff of Surplus Specialists ready to help you through the process. What type of packaging does McKernan buy? We deal primarily in unused and unbranded closures and containers like bottles, jars, tubes, caps, droppers, cans, pumps, tins, triggers, dip tubes, aerosol, fitments, sprayers, compacts, and applicators. However, we deal in a variety of other packaging and promotional items. We are always interested in hearing what you have to sell. So, don’t be afraid to ask. Let McKernan do the work while you reap the reward! Major marketers like Procter & Gamble, Revlon & Heinz have found that McKernan Packaging Clearing House is the answer for erasing losses on overstocked or discontinued packaging components. Each year, we move hundreds of millions of surplus, obsolete or excess packaging units creating an efficiency of scale which allows us to pay top dollar for your surplus.